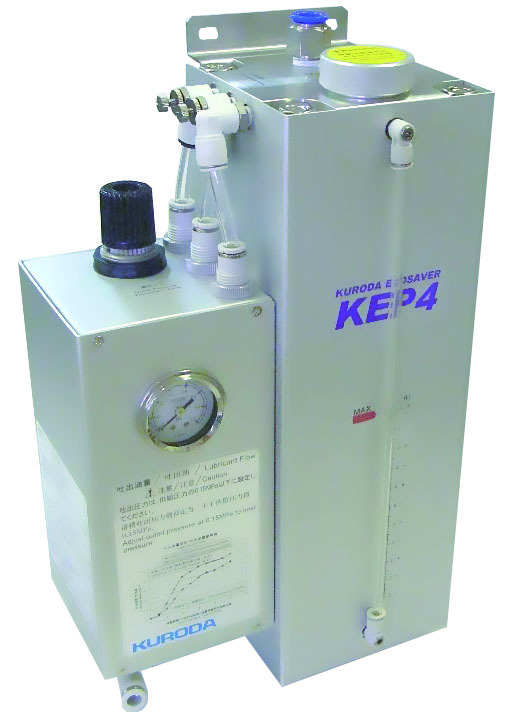 ECOSAVER® / KEP4 (Equipment-mounted Type) | Products | Kuroda Precision Industries Ltd.
Semi-dry processing is an eco-friendly cutting technology that not only reduces the quantity of cutting oil used or reduces the cost of disposal of oiling equipment and waste oil processing, but also increases the cutting tool life and maintains the cutting accuracy. ECOSAVER®, the minimal quantity lubrication system, generates mist inside the container by atomizing oil by using compressed air to only supply microscopic oil mist (microfog) along with air to the outside of the container. ECOSAVER® KEP4 is constructed to only supply mist with particle diameter of around 1μm, so that the cutting oil reaches the processing area in approximately 1 second from the start of ECOSAVER®, even when used in high speed machining centres or supplied via complex piping.